Pardon my absence yesterday, I had intended to post but I ended up falling asleep with LO during her bedtime. I was exhausted from lack of sleep the night before because I had a work dinner out in the boonies and then had to book it to the airport to pick up my mom after her delayed flight. I got to bed after midnight but then woke up at 3 in the morning because LO was crying. I couldn't figure out why until she projectile vomited on me. After cleaning up, I tried to sleep again only to wake up at 6 to go to work. Oy vey, what a night. Nothing like being at work for 8 hours in zombie mode! I finally got a chance to swatch Close Encounter by My Ten Friends, a delightful combination of multi-sized black and gold hex glitters in a sheer violet jelly base. The maker gets her inspiration from a photo of the universe, where purple represents space itself, the gold twinkles like stars, and the black are little dark pockets of space. The bottle itself is like looking into a tiny little galaxy. The polish had a slightly thick consistency and I found the base color to be fairly sheer. I used three coats in these pics - two thin coats first followed with a third lightly dab and spread layer. This is finished with a layer of Essence Gel Look topcoat. 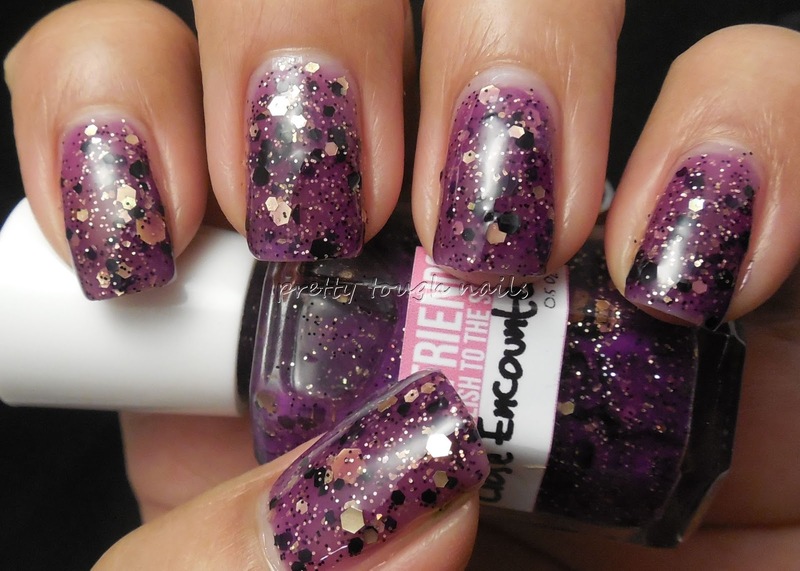 The sheer base works for this polish because it gives it that squishy appearance and the glitters look like they're floating within, just like outer space. I have to work on my application though, I failed at making a small cuticle gap. But who cares, I'm too busy drooling over the combination of colors, especially the fashion forward contrast of black and gold glitter. Make sure you're online Friday when MTF releases her newest collection for the summer solstice. It's called The Sparkly Cycle Of Summer guarantees to be out of this world! This is really pretty! Aside from it looking like a galaxy, it kind of makes me think of peanut butter and jelly. You're right! Now I'm hungry!